Eighty-six-year-old Aicha El Kharz has lived in Tangier’s madinah for most of her life. Her surprisingly youthful eyes peer over reading glasses as she tells you that she used to work in the neighborhood as a cleaning woman. She did so without being the least aware of the political and social significance of a certain building on the Rue d’Amerique, a building she now walks to twice a week with the aid of her cane. That Mark Twain, Paul Bowles, Malcolm Forbes and many other American diplomats, artists and businessmen preceded her in walking the halls and rooms of this building means little to El Kharz. Nor does it matter to her that this is the only us National Historic Landmark building outside America. The Tangier American Legation, as the building was long known, is where El Kharz and hundreds of other women in the madinah (the walled and fortified heart of the city since the 14th century) are learning to read. “I want to be able to read the Qur’an,” El Kharz says, catching her breath as she works on basic Arabic sentences amid a class of 25 women with dreams of where literacy can take them. 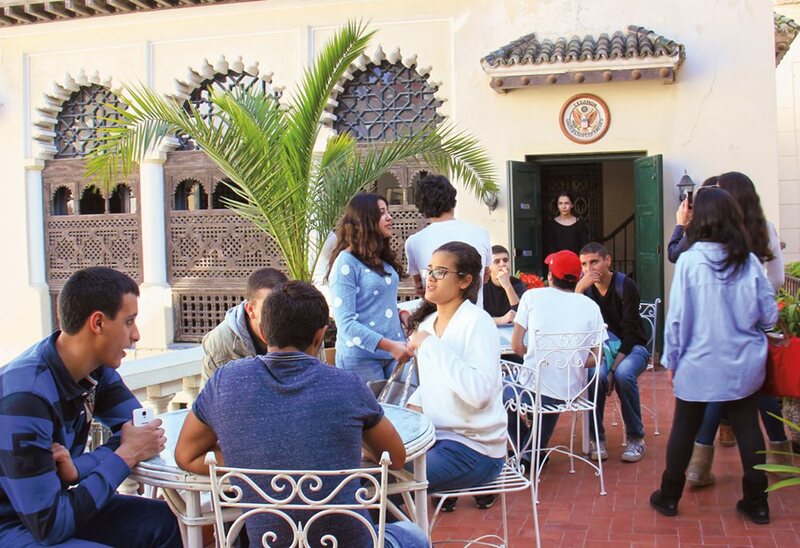 Moroccan students on a field trip relax on the terrace of the Tangier American Legation Institute for Moroccan Studies, or talim. A gift to the us in 1821 from Sultan Mulay Suleiman, the “embassy without an ambassador” —the American Legation, Tangier—became a gathering place for diplomats, business leaders and writers. In the late 1990s, it refocused its mission on education. Today the building is called the Tangier American Legation Institute for Moroccan Studies, or talim, an acronym that doubles as the Arabic word for “education.” The name change reflects its own change from the diplomatic and business center for expatriates it once was to its role since the late 1990s as a community center. As she talks, she has to strain her voice to make herself heard above a din of hammering and drilling on the roof. Most of the staff of seven—which includes three maintenance workers—shrug off the noise, as renovations are nearly constant. The building’s upkeep is paid for by the us government, which owns the property, although talim’s various projects, as well as its staff salaries, are funded through non-governmental grants and donations. The Legation’s terrace looks out on the strategic harbor that connects Morocco to both the Mediterranean and the Atlantic. 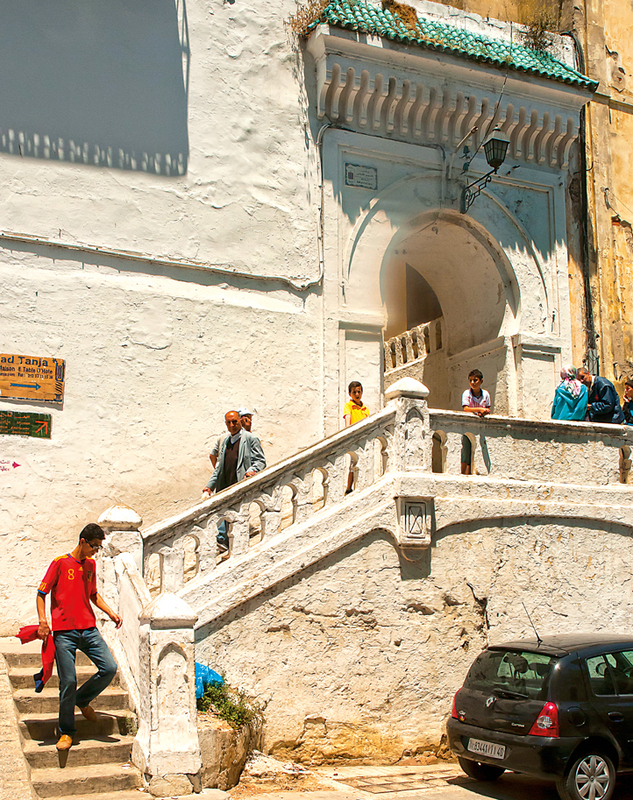 Winding up from the narrow Rue d’Amerique in Tangier’s madinah (old walled city), residents climb the stairs to talim’s arched doorway. 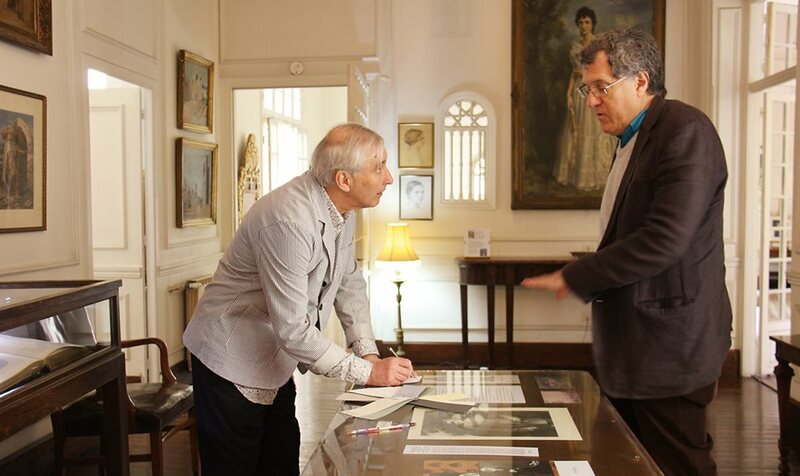 talim director John Davison also speaks above the racket as he discusses with an interior designer visiting from the uk a new wall color for one of the gallery rooms. The designer decides a door has to be removed to give a better view of an intricately carved grandfather clock in the corner; the maintenance crew has it off and stored away within an hour. talim is evidence that a building is rarely just a building. It’s also an ever-changing, evolving keeper of the stories of the people who built it, lived and worked in it, and still protect it—and of the stories of the city in which it resides. The original structure, which is more than 200 years old, is now attached to two other buildings. This makes talim a bricolage of unexpected wings, unpredictable stairways and hidden doorways, all festooned with paintings of the Americans and Europeans who lived in this diplomatic and trade hub at the gateway between the Mediterranean Sea and the Atlantic Ocean. 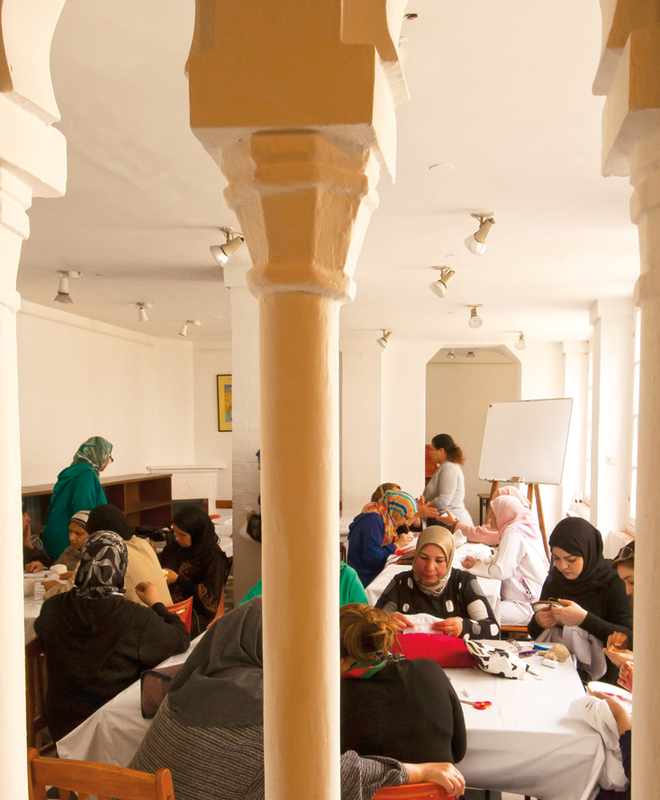 Learning new skills and sharing generations of knowledge, more than 150 women of the madinah take classes at talim for personal enrichment and job opportunities. talim’s many appendages, added and altered over the years, are matched by the diverse roles they play. On one spring day, several tourists from Spain (a 20-minute boat ride away) stroll in the art gallery while Moroccan high-school students on a field trip flirt on the garden terrace and an American graduate student researching Middle Eastern hip-hop naps in her guest apartment. Meanwhile, two Moroccan university students troll through 400 years’ of books on the Maghrib in one of five hard-to-find library rooms as 20 local women joke with each other in the kitchen, where they are learning to make taj, a local marzipan biscuit not quite Middle Eastern, not quite European. 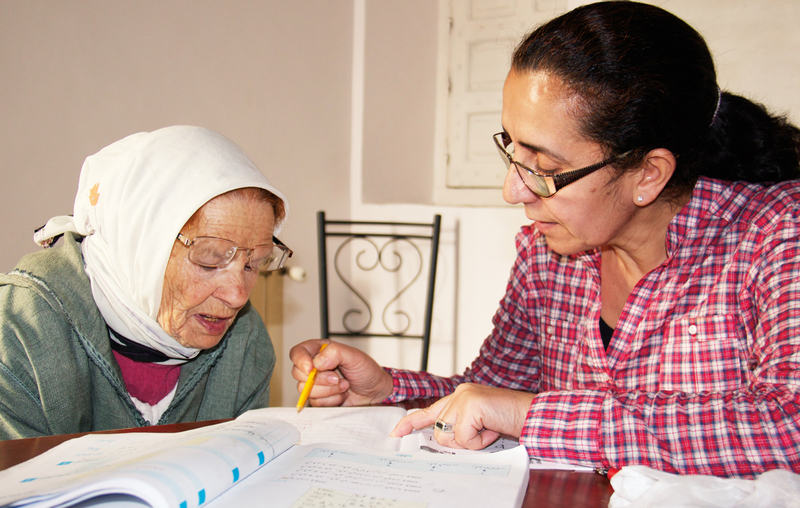 Aicha El Kharz, 80, reads Arabic with teacher Fatima Ben Guerch. Due to the eclectic architecture, these groups are largely unaware of each others’ presence. Nor is this a place one comes upon by accident: Taxi drivers are often confused when told to stop at the madinah’s Bab d’Amerique (“American Gate”), as this is a residential area, set apart from the tourist cafés, carpet sellers and snake charmers by several alleyways that admit little sunlight. talim’s neighbors are all Moroccan families. Some have been there ever since the original building was given to America by Morocco in 1821, and some of the members of those families study at talim. The two security guards at the entrance, with no one to talk with most of the day, look forward to school and work letting out, as that’s when residents young and old stop to chat on their way home. The madinah’s 173,000 residents today form a working-class urban core surrounded by nearly 1 million more Tangerois who live beyond the walls that define the old city. The madinah was the city that largely stood in 1777, when the seas were battlefields of trade and European colonial expansion, and when Morocco’s Sultan Mohammed iii recognized the us as an independent nation, making Morocco the first country officially to do so. That relationship was formally recognized in 1786 by the Moroccan-American Treaty of Friendship signed by the sultan and Thomas Jefferson, among others. It remains the us’s longest-standing treaty. 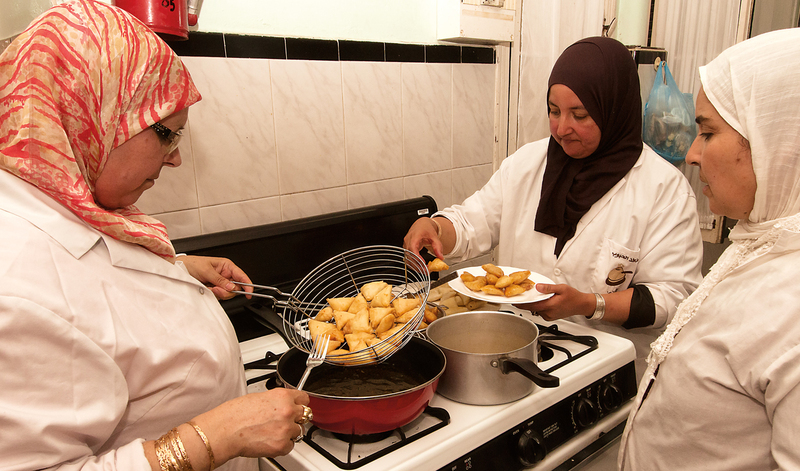 In June, the talim Woman’s Program, founded in 1994, awarded 59 certificates for the completion of courses in cooking, Arabic literacy and sewing. According to Italian historian Carlo Giuseppe Guglielmo Botta, author of The History of the War of Independence of the United States, Sultan Mohammed iii’s initiative was a response to American appeals, delivered through France, beseeching his help in protecting us merchant ships from pirates on the Barbary Coast. Seeing future business opportunities in backing the newly declared us while he reestablished Morocco’s strength after years of infighting, the sultan agreed. Nearly half a century later, in 1821, Sultan Mulay Suleiman furthered the relationship by giving the building to the us in recognition of the 1786 treaty. With so much of the world’s trade going through the Strait of Gibraltar in the 1800s, the need for us and European legations in Tangier expanded, but when Mark Twain visited the American consul and his family in the 1860s, he was struck by how quiet life was. Indeed, in Innocents Abroad, published in 1869, he wryly noted that the high point of the consul’s day, in a city with no other Americans, was the arrival of the mail. By the 1920s, however, European orientalist writings and art had sparked a romanticizing of Tangier among American writers and artists as a “new Paris,” full of foreigners and the gateway to North Africa. Set on a donkey and posed in front of the Legation is Alice Dodge, daughter of Henry Percival Dodge, who served as us envoy from 1909 to 1910. One of hundreds of images from the early to mid-20th century now in talim's archives, it offers a glimpse back to a more formal, socially stratified era. 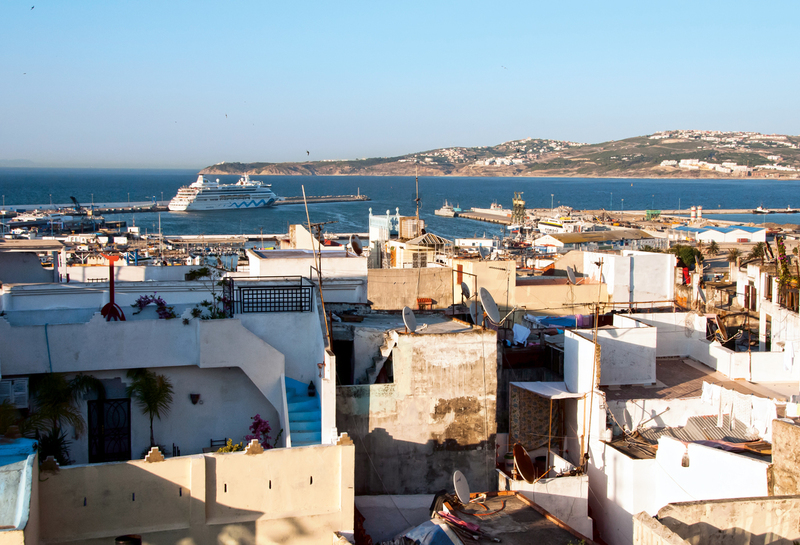 After World War i, Tangier became an open international zone where its residents were not subject to the trading laws of their native countries. After the war, writers the likes of Truman Capote, Gore Vidal and William Burroughs continued to come, and at the Legation they had documents notarized and random clerical matters handled. One of the most popular draws in talim is the Paul Bowles Wing, which pays homage to these writers. Bowles himself donated 72 hours of traditional and nearly extinct Moroccan music he recorded in the 1950s, and talim is in the process of digitizing the archive. 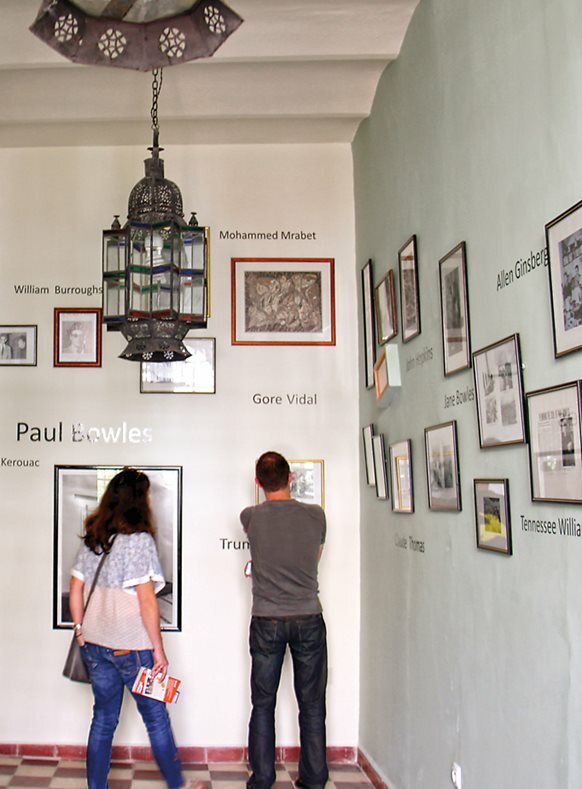 Popular with tourists visiting talim is the room of photographs showing Legation literati, named the Paul Bowles Wing after the author and musicologist who spent decades in Tangier and donated some 72 hours of traditional Moroccan music that he recorded in the 1950s. Bowles’s music is one of the many discoveries to be made at the library, which also holds nearly 8,000 books, the oldest dating to the 15th century. Most are in English and French, but there are some Spanish, Portuguese and Arabic titles. The library is for research, not open to the public, and it draws mainly Moroccan and American graduate students. Perusing the library rooms, packed ceiling-high with books, visitors find translations of the travels of Tangier’s native son Ibn Battuta, volumes on history and politics in the region, orientalist novels set in Morocco, Fodor’s Travel Guides from the 1960s and ’70s, as well as more modern books such as Paula Wolfert’s Couscous and Other Good Food from Morocco—the last inscribed by the author to Malcolm Forbes, publisher of Forbes magazine and former owner of an estate and museum for toy soldiers near Tangier. Today, two of Forbes’s toy-soldier dioramas are popular with visitors to talim. Other donors, often the heirs of former diplomats in Tangier, gave photographs that date mostly from the early to mid-20th century; many are still in cardboard boxes awaiting digitization. 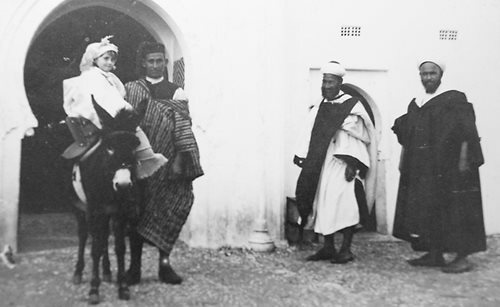 Looking through the photos, viewers see Western men in formal suits and Western women in long lacy dresses, often with Moroccan servants taking care of their carriage horses just outside the Legation. At least in the idealized world of images, it was a good life for expatriates, who by then made up some half of Tangier’s total population. Then came Moroccan independence in 1956. Tangier’s free-trade status ended and, for many of the expatriates, the appeal of the city waned. 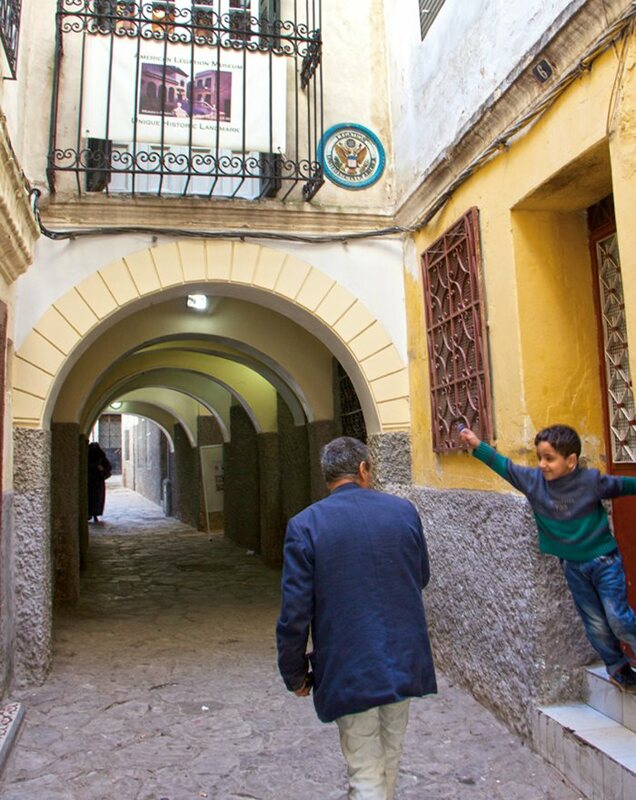 By the 1980s, only about five percent of Tangier’s residents were non-Moroccan. One who has stayed is artist Elena Prentice. Her grandfather was the consul general at the Legation, her uncle was an oss officer there, and she served as talim’s director in 1989 and 1990. She left for a few years, but in 2002 she returned permanently to Tangier. The cultural center’s museum covers a history of envoys and emissaries back to the 1786 Moroccan-American Treaty of Friendship—the first international treaty signed by a us still in the throes of war for independence from Great Britain. She recalls that in the past there had been little mixing between the people of the madinah and the foreign communities, and that during her stint as director she worked on integrating the building into the community. She founded a newspaper, Khbar Bladna (News of Our Land), to publish stories in the local dialect after realizing that much of the neighborhood couldn’t read classical Arabic. This was, inadvertently, the first step toward today’s literacy programs—and the notion that the Legation has a wider future purpose, one focused on its neighborhood. Today the energy of the Legation comes from the students of the madinah. In 1998 a group of civic-minded Moroccans got together and formed the volunteer organization Fondation Tanger Al Madina, or fatm. “We realized no one was taking care of the madinah,” says Adil Alaoui, fatm’s president. A university professor with doctorates in physics and civil engineering, he has fond memories of visiting his grandmother in the old city when it was still the main shopping area. “No one was protecting it as a heritage site, cleaning it up,” Alaoui says. “We tried to get the community interested, but we realized that there were more pressing problems than protecting heritage. Most people in the madinah live on low incomes, and to them there was only one major problem: how at the end of the month a man could pay all of the bills. We started talking to the women. They are the pillars of the family, but we found out most of them had not gone to school. They couldn’t help their children with their studies. “They needed to read—even to read recipes to work,” he adds, for the most common form of employment for women is in the food-and-beverage industries of the vital tourist trade. talim director John Davison, at right, reviews paint colors for another renovation in the building that has been expanded and remodeled numerous times since 1821. Davison explains that a “legation” ranked higher than a consulate but lower than an embassy. “Now, it’s just the name of the building,” he says. At the time, the Rue d’Amerique was considered one of the roughest parts of the madinah, with high crime and prevalent drug abuse. Fatm representatives talked to their talim counterparts, who agreed that it would host the classes. They started out with one volunteer teacher and four students. The classes also include lessons about the Qur’an, basic math and Moroccan history and civics from free government textbooks. Women gather in an embroidery class. All the staff brags about one star alumna, Fatima Gharboui, 65, who was one of the first students. She has become a recognized artist for her paintings of the neighborhood and rural life of her childhood. Still, talim staged an exhibition, and it proved popular. People talked to Gharboui and bought her work, but no one knew if it was her story or her artwork that intrigued them. “So we did a second exhibition, and she sold a painting for 500 dirhams [$50],” says Bouziane. “Then her work started to be shown in galleries in London and Marrakech and Tangier, and started selling for 5,000 and 6,000 dirhams, and she got electricity at home as a result of that. Before, she had been painting by candlelight. Indeed, the classes feel like a neighborhood sorority. “The women have helped us bolster civic pride in the neighborhood,” Alaoui says. Some of Gharboui’s art hangs in talim’s art museum, which opened in 1976. Mohammed Jadid, who has been curating and collecting for 15 years, estimates that 600 to 900 pieces have been donated. 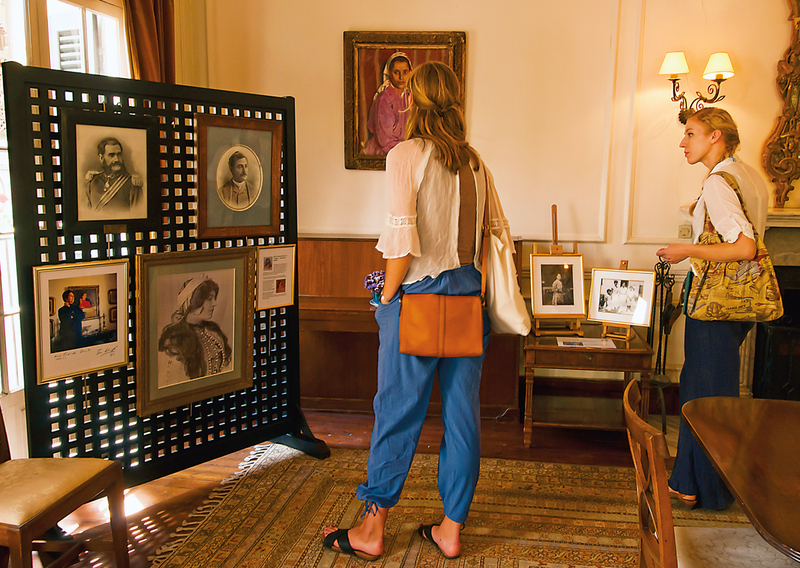 They include many portraits of the wealthy expatriates who once lived here, as well as paintings those expatriates themselves made depicting the region. Gharboui’s works are the first by a contemporary resident of the madinah. For Gharboui, El Kharz and most of the older women, the desire to read the Qur’an is the main reason they say they want to study at talim. Younger women are more inclined to see it as a doorway to employment. The youngest student today is 22, and many are in their 30s, 40s and 50s. 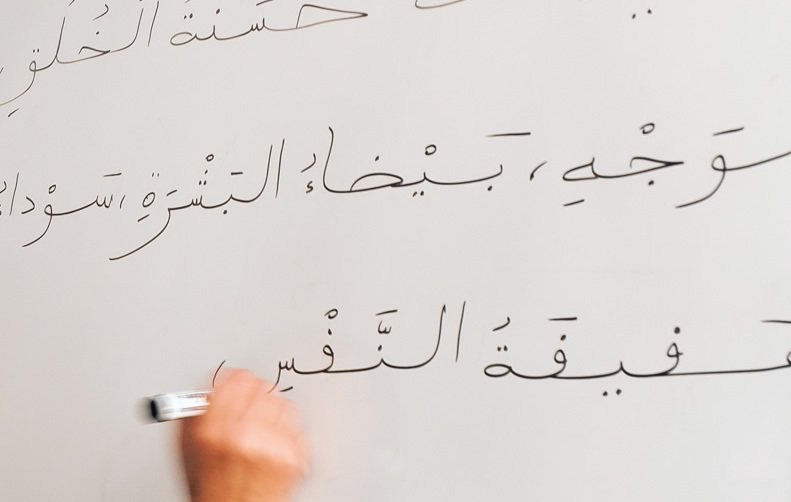 Once a student has passed through three levels of Arabic, she may take embroidery, cooking and foreign-language classes that vary with the expatriate women who volunteer to teach them. 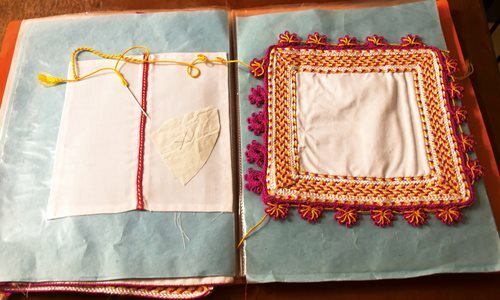 The embroidery classes and cooking classes, which began 15 and five years ago, respectively, function almost as a reward for the younger students—and as job training, too. The Legation’s circular, eagle-emblazoned crest appears above an archway along one of the madinah’s narrow streets that surround—and, here, runs underneath—talim. “They can’t take these classes until they finish the literacy classes,” says Rahma Bounhani, a teacher who learned cooking and sewing from her mother and at trade school. 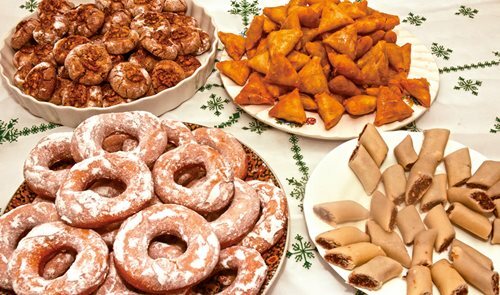 “We want them to be able to get jobs in tourism or perhaps in the catering cooperative we started.” She focuses mainly on sweet-and-savory pastries, which the students proudly share with staff and guests. The goal of workforce preparation became particularly important in 2008 when the global economic crisis hit Tangier and many factory jobs disappeared. Today Tangier is undergoing a manufacturing boom, with international companies such as Renault and Toyota setting up plants as the Moroccan government invests in making the city a major trade hub again. The work includes building the new Tanger-Med Port, which will double to 8 million the number of containers the harbor can handle. Tangier remains a city that draws tourists looking for snake charmers and other whiffs of exotica, but it is looking at a future that depends more on acumen than charm. Americans who have invested time here agree.